Meeting-Debate on body odours and niche perfumes. Another success for the “Mauro Lorenzi Profumi” brand An intriguing evening, cultured and refined, attended by many science, dermatology, pharmacology and cosmetics experts, as well as representatives of the academic, information and theatre world – here’s the description of the event that took place in Rome, in the historic “Spazio 5” location, in via Crescenzio, whose topic was “Body odours and niche perfumes”. The “Spazio 5” is a historical meeting point for artists and intellectuals alike, who have frequented it since the 60s, when it was animated by famous photographer Carlo Riccardi. It is now the home of the Quinta Dimensione Institute, directed by his son, photographer Maurizio Riccardi, connected to the world of art and communication. 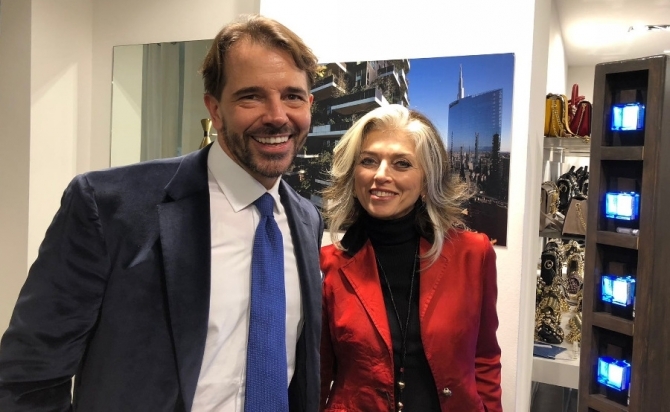 The event, organized by the Dermart Association, featured speeches by authorities such as Professor Massimo Papi, country-wide famous dermatologist, and perfume stylist Mauro Lorenzi, creator of the “Mauro Lorenzi Profumi” brand. After illustrating to the guests the anatomy of the olfactory apparatus and the function of chemoreceptors, Professor Papi, as an established painter and a lover of art history, drew inspiration from the works of great artists (Caravaggio, Degas, Renoir, Toulouse-Lautrec and Balthus) to explain how our skin gives off a very personal and characteristic odour. This depends mainly on the type and amount of bacterial flora on it, which metabolizes the substances secreted by our sweat glands and skin cells (scalp = sweat and sebum, underarms = sweat, feet = sweat and keratin). He stressed that some specific pathological conditions, such as diabetes, but also healthy hormonal changes, certain foods, as well as the use of certain medication, can influence our body odours. He also specified that the smell of our skin (in particular the skin of our armpit) was considered by some civilizations as a positive trait (intense smells were synonymous with greater attraction and sexual prowess), even though these odours are currently considered repulsive and undesirable. In his speech, equally as brilliant and applauded as Papi’s, full of narrative references to the successful novel “Perfume: The Story of a Murderer” (Das Parfum – Die Geschichte eines Mörders) by Patrick Süskind, Lorenzi highlighted the role of olfactory memory, which, when stimulated, has the ability to remind us of a past experience deeply rooted in our memories. This ability can immediately awaken a wave of dormant memories, allowing a moment of our existence to resurface and, depending on the memory, fill us with joy, melancholy, sadness, or nostalgia. “Nothing is more memorable than a quality scent or perfume that can withstand the wear and tear of time. To achieve this, a niche fragrance – the stylist emphasized – must possess three very specific characteristics. The first is identity, which is not only important for the perfume and the essence themselves, but also for the wearer; the second is persistence, because a perfume must be able to accompany us throughout the day, remaining on our skin at least for 20/24 hours. The final one is well-being, which is the feeling that one must get when wearing a perfume, a feeling of comfort and completeness. Naturally, this feeling of wellness will be linked to our experiences, in order to create our own olfactory memory. A quality perfume must be able to become our second skin”. To conclude, Lorenzi described the olfactory pyramids (top notes, heart notes and base notes) of the seven fragrances of the “Septimontium” collection, inspired by the seven hills of Ancient Rome (Aventinus, Caelius, Capitolium, Esquilinus, Palatinus, Quirinalis and Viminalis), and the two fragrances of the “Sorrente Nostalgie” collection, inspired by the citrus groves and the sea of ​​the Land of Sirens (L’Orange and La Mer). After a fun and lively debate with the public on the topic of bodily odours, especially when it comes to intimate relationships, all the participants wanted to test the quality of the Roman brand’s fragrances, which were unanimously acclaimed as a success.